ARE YOU A FEMALE BLOGGER LOOKING FOR A COMMUNITY? Do you long for connections, support, encouragement? Tired of just focusing on numbers? Those who want to build friendships and build one another up. Those with questions related to blogging. Those looking for feedback or collaboration on their blog. Those who wish to share their knowledge/expertise about blogging in relation to questions from the group. This group is all about community, connection and support, not spam and promos. This keeps the wall more open for those who with legitimate questions or need for support. ABSOLUTELY NO PROMO WALL POSTS! There will be daily threads to share your posts and/or social media, created by the admins. Affiliate links are not allowed, unless given admin permission. This includes promoting your blogging courses! You can share your latest news, post or products on the Daily Promo threads only. We have plenty! Please see the additional schedule below. When possible, please reply to the thread as opposed to starting a new post. Excessive promotion will result in your removal from the group at the discretion of group admins. When added to the group, please read the Pinned Post before participating in any threads. *Every weekday we have at least 6 threads: Blog Post Share, Retweet, Repin, Instagram, Facebook and YouTube. In addition, here are the daily themes that you can expect every week. Please be sure to post your responses in the comments for that day’s thread, not in a separate post. Although questions are always encouraged, it’s nice to have a central place we can ask questions. This thread is just for just that – ask any and all questions related to blogging, social media, marketing etc. Someone has been there before and would be happy to help! Looking to COLLABORATE with bloggers in your niche? Connect with other bloggers here for guest posts, interviews and other projects here. Looking for a designer, guest blogger, etc? Do you need testimonials? Looking for people to join your link up? This is the day to do it! Have you learned something new lately that would be useful for other bloggers and designers? Is there something you wish you knew as a new blogger? Share with us here. Do you have a post you would like shared on social media? Today’s the day to share your post and then spread the love for others. We rotate through the social platforms and help each other build our followings, according to niche! This is a great way to connect with your fellow bloggers and help them get noticed on social media. What worked for you this week? What can we help you celebrate? Did you do something amazing or learn something new? Share your wins with us! We also have a “chit chat” thread where we chat anything and everything “non-blog” related. It’s a great way to build friendships in the community! What are you working on this week? What are your goals? Something to forward your business or blog? Share with us your intentions and we’ll do our best to support you. We also experiment with other threads on occasion with help from member feedback. This group is not for everyone – just because you are a blogger does not mean it will be a good fit. While we do not discriminate, we want women in our group who truly lead with their heart first. We do have share threads, but the group is so much more than that. It is a tight knit community and we protect the integrity of the group first and foremost. Please only request membership if you are committed to what we stand for. 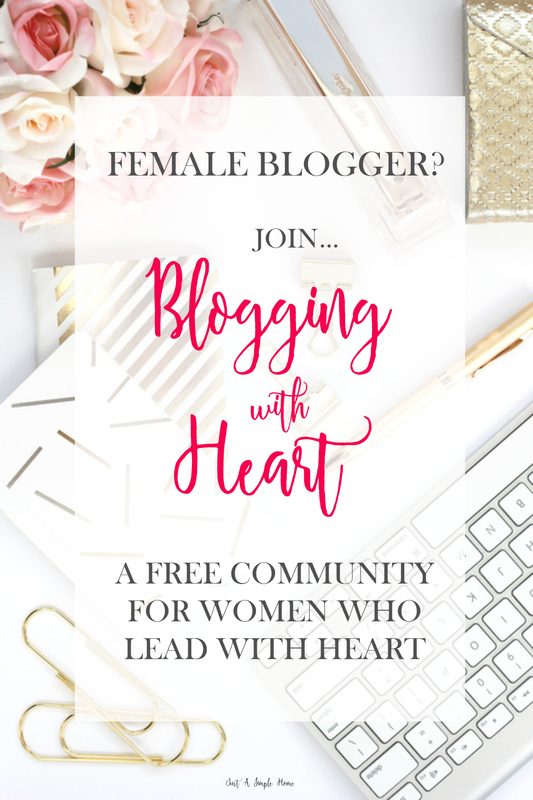 Blogging With Heart is an amazing group, full of wonderful women who lead with heart. It is not for everyone, but if it speaks to you, please come check us out! Questions and feedback solicitation is allowed (and encouraged) every day! So don’t hesitate to ask the group whenever you’re stuck or need advice! I can’t apply? It just does’t do anything when i click ‘join’ – please help, I really wanna join! LOVE this!! I applied and can’t wait to join! This sounds like a lot of fun! I definitely signed up and cannot wait to get started! Sounds like such a great group to be apart of!! You are speaking right to my heart with this one! Can’t wait! Communities are amazing things to build with! This one sounds amazing and like a wonderful group to join! Thank you for starting/sharing it. Thanks Kristin! I am so glad you are joining us! This is a great idea! Besides the daily themes, do you engage your community in other activities?